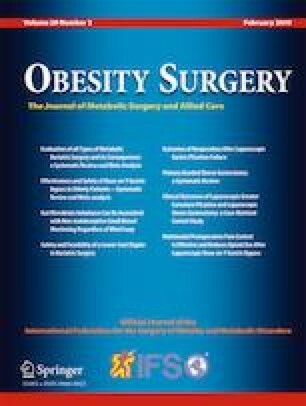 There is a growing interest in comparing the effectiveness and costs of alternative forms of bariatric surgery. We aimed to examine the per-patient, procedural costs of Roux-en-Y gastric bypass (RYGB), sleeve gastrectomy (SG) and adjustable gastric banding (AGB) in the United Kingdom. Multi-centre (two National Health Service; NHS and one private hospital) micro-costing, using a time-and-motion study. Prospective collection of surgery times, staff quantities, equipment, instruments and consumables for 12 patients (four RYGB, five SG, three AGB) from patients’ first surgeon interaction on the day of surgery to departure from the theatre recovery area. Costs were attached to quantities and mean costs compared. Sensitivity and scenario analyses assessed the impact of varying surgery inputs and consideration of additional plausible factors respectively on total costs. Mean procedural costs were £5002 for RYGB, £4306 for SG and £2527 for AGB. Varying staff seniority or altering procedure times had small impacts on costs (± 4–6%). Reducing prices of consumables by 20% reduced costs by 10–13%. Accounting for differences in surgical technique by altering the number of staple reloads used impacted costs by ± 7–10%. Adjusted total costs from scenario analyses were similar to NHS tariffs for RYGB and SG (difference of £51 and -£119 respectively) but were much lower for AGB (difference of £1982). These detailed costs will allow for more precise reimbursement of bariatric surgery and support comprehensive assessments of cost-effectiveness. Additional work to investigate costs of post-surgical care, re-operations and life-long support received by patients following surgery is required. The online version of this article ( https://doi.org/10.1007/s11695-018-3553-9) contains supplementary material, which is available to authorized users. By-Band-Sleeve Trial Management Group: Jane Blazeby (Chief Investigator), University of Bristol; Richard Welbourn (Surgical Lead), Musgrove Park Hospital; James Byrne (Surgical Expertise), Southampton University Hospitals NHS Trust; Jenny Donovan (Qualitative Research Lead), University of Bristol; Barnaby C. Reeves (Methodologist Lead), University of Bristol; Sarah Wordsworth (Health Economics Lead), University of Oxford; Robert C. Andrews (Endocrinology Lead), University of Exeter; Janice L. Thompson (Nutritional Lead), University of Birmingham; Graziella Mazza (Trial Manager), University of Bristol; Chris A. Rogers (Trials Unit and Statistical Lead), University of Bristol. This study is funded by The National Institute for Health Research Health Technology Assessment (NIHR HTA) programme (project number 09/127/53) for which Richard Welbourn, Nicholas Carter, James Byrne, Chris A. Rogers, Jane M. Blazeby and Sarah Wordsworth are investigators. The views and opinions expressed are those of the authors and do not necessarily reflect those of the HTA programme, NIHR, the UK National Health Service, or the Department of Health. Jane M. Blazeby is an NIHR Senior Investigator. Author 2 declares receiving support from Ethicon Endo-Surgery for attending conferences and funding a Bariatric Clinical Fellow as well as receiving honoraria from Novo Nordisk. Author 5 received salary funding from the British Heart Foundation. All the other authors have no conflict of interests to declare, except support from a government grant detailed in the acknowledgements. The National Research Ethics Committee South West – Frenchay approved the micro-costing on 6th December 2011 as part of the BBS study protocol. All procedures performed in studies involving human participants were in accordance with the 1964 Helsinki declaration and its later amendments or comparable ethical standards. Informed consent was obtained from all individual participants included in the BBS study. Scottish Health Service Costs - Theatre Services (R140X): Number of theatres, expenditures and usage, by board [database on the Internet]. ISD Scotland. 2017 [cited 15 February 2018]. Available from: http://www.isdscotland.org/Health-topics/Finance/Costs/Detailed-Tables/Theatres.asp. Reference Cost Collection: National Schedule of Reference Costs, 2016–17—NHS trusts and NHS foundation trusts [database on the Internet]. NHS Improvement. November 2017. Available from: https://improvement.nhs.uk/resources/reference-costs/. 2017/18 and 2018/19 National Tariff: currencies and prices [database on the Internet]. NHS. 2017 [cited February 15, 2018]. Available from: https://improvement.nhs.uk/resources/national-tariff-1719/.